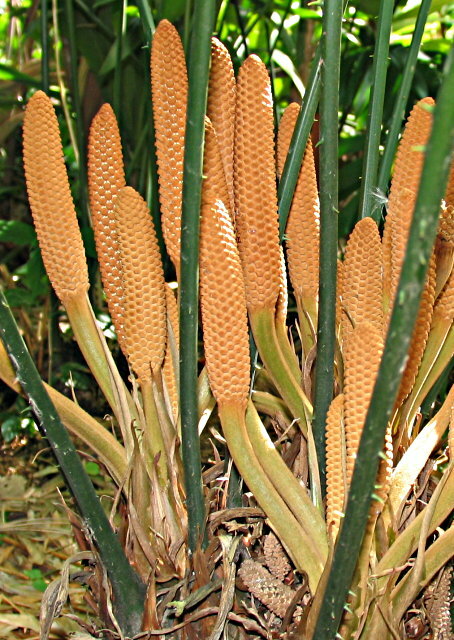 This article discusses the exotic group of American cycads known as Zamia. There are approximately seventy species and they differ widely in their appearance and growth requirements. Cycads are present across many areas of this planet. But, the genus of Zamia only comes from the New World, both above and below the equator. This is a large genus and species extend up into the southern United States and as far south as Chile and Brazil. Species show a wide diversity of appearance with some having small, simple leaves and others having large, plicated leaflets with a texture like the Pringle Potato Chip. Many species are small in stature and there are a few species that tower overhead. Below we will discuss the genus in general, make comments about their culture and diseases, and then show an assortment of individual Zamia species. Zamia is a diverse group of cycads ranging in their far northern distribution from Georgia in the U.S. south through the Caribbean and Central America. These native habitats extend further south to northern South America with some even into Bolivia and Argentina. Most are small compared to other types of cycads. Many have subterranean trunks with what appears to be leaves emerging from the forest floor. Others, like Zamia fairchildeana, have trunks that grow vertically and have a large canopy of leaves overhead. One species, Zamia pseudoparasitica, is an epiphytic cycad growing off the ground in the tree canopies. 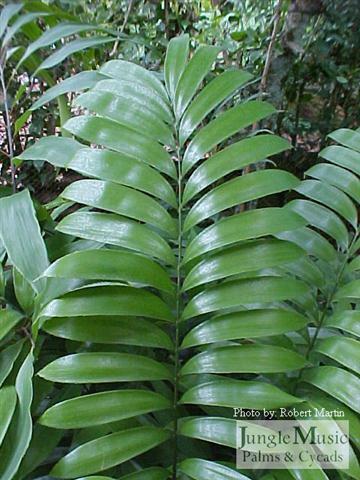 Leaf length of Zamia vary from about a foot to large dependent leaves over six feet long. Leaflet size is variable as well, with some only a quarter of inch wide and others nearly one foot in width. Leaflet length varies from a few inches to over two feet long. 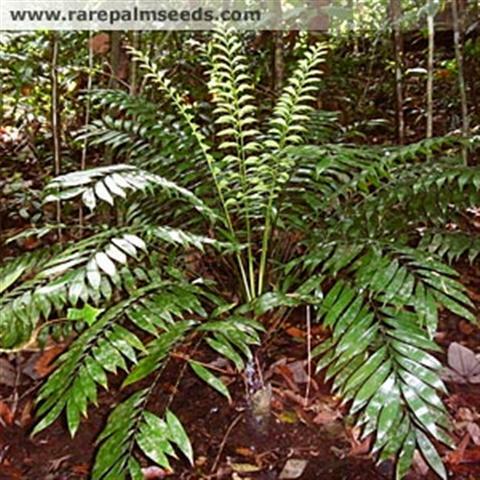 Zamia have pinnate types of leaves with a central rachis and leaflets forming off the rachis. Some species have colorful new emerging leaves showing such colors as brown, bronze, pink or even red. These colorful new leaves typically turn green within a month or two. Some species have sharp spines on their petioles. Leaf texture on some is smooth and shiny while others have strong veins, almost like a ruffled type of potato chip. Leaflet edges are often serrated with small teeth or irregularities. There are both male and female plants with both sexes producing cones, sometimes with exotic colors. Roy Osborne, a world authority on cycads, recently emailed me and informed me there are seventy-one species of Zamias at time of publishing of this article. There is a tremendous array in the appearances of the leaves of this genus. In terms of orientation, some are very upright. Others, like Zamia pseudoparastitica, are very dependent and hang downwards way below the stem. For many species, new leaves flush green. But, others are gold, bronze, brown or red emergent. These colors are transient and typically revert to a green color over a short time. Leaf length can be as short as one foot long in some dwarf species. Others have leaves of six or more feet. Leaflet appearance is also variable. Most species have serrated edges, but many are smooth without teeth. Pictures below will show the variation in the appearance of leaves. Of note, some of the most sought after species have wide, exotic leaflets. The leaf stems of Zamia are typically armed with small spines. Some species have almost or completely smooth petioles. One species shown below, Zamia picta (variegata), has variegated yellow splotches on the leaflets. The trunks of cycads are called stems or caudexes. These are the woody structures that support the leaves of the plant. 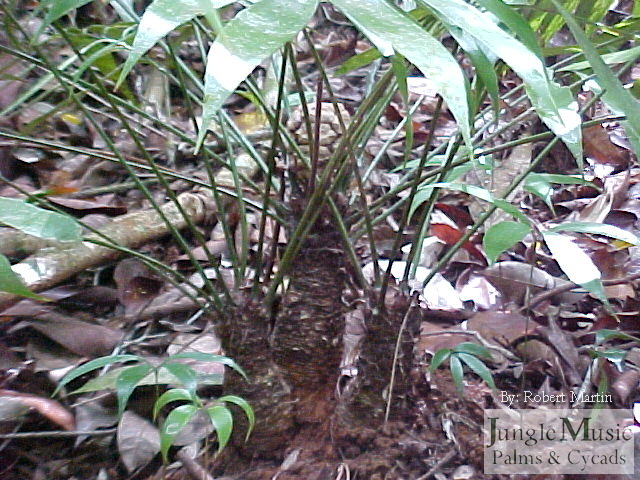 Typically with Zamia, these stems are hidden partially or totally below the ground. These are referred to as subterranean caudexes. Sometimes the trunks will emerge from the ground and grow vertically. 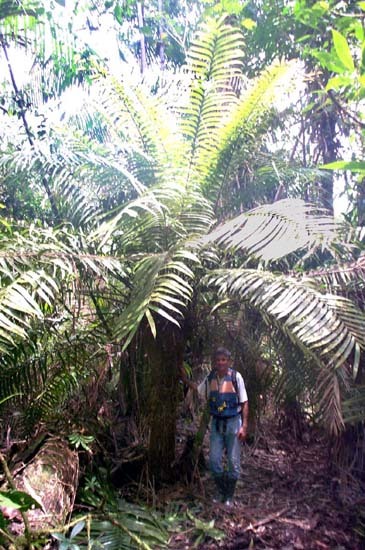 There are species in Costa Rica and Panama that get almost ten feet tall. With time, often trunks will bend toward the ground and be decumbent. Or, a trunk may lay on the ground for a ways and then curve upward toward the light. Most trunk diameters are in the three to six inch category. 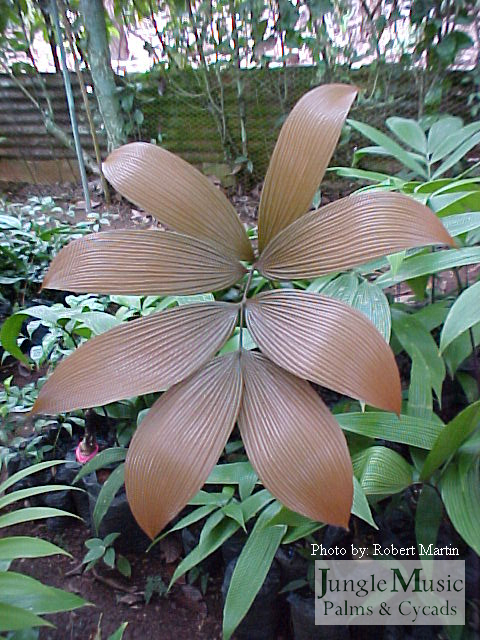 The common Cardboard Zamia, Zamia furfuracea, can get globular trunks to 10 inches in diameter. Sometimes trunks appear to be spherical and small, almost like a baseball in shape. The reproductive parts of Zamias are called "cones". Just as cycads are part of the Pine family, it is not surprising that these similar seed producing structures are given the name cone. There are male and female cones. Pollen from the male must be deposited internally into the female cone to produce viable seeds. These is usually accomplished by native insects but can also be done by wind or human assistance. Enthusiasts will collect pollen from a ripe male cone and manually introduce it into a receptive female cone. In the same fashion, interspecies hybrids can be created. Male Zamia pollen is typically white in color and almost looks like talcum powder. Transmission of this pollen to the female can be accomplished utilizing a fine artist's brush or by creating a solution in water and injecting it into the female cone. As colonies of Zamia of different species may occur in the same area, the possibility exists for natural hybrids. But, in most cases, species colonies are quite a distant apart and this doesn't occur. 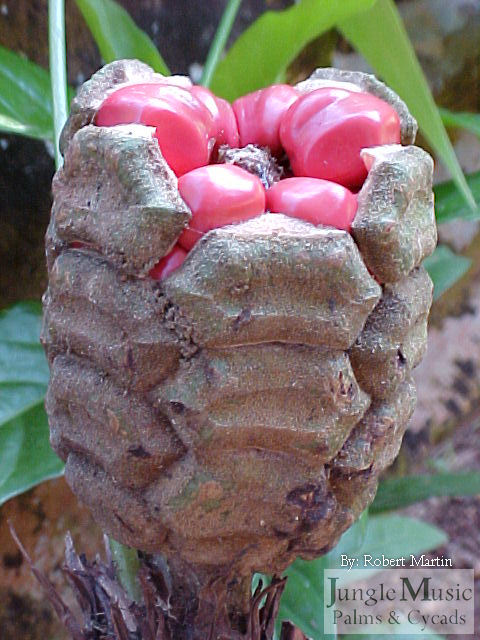 In contrast, in tropical domestic gardens where different species may be side by side, seeds produced are often hybrids. As seeds mature, the female cone swells in size. Near maturity, the scales of the cone may open up somewhat, showing colorful seeds inside. 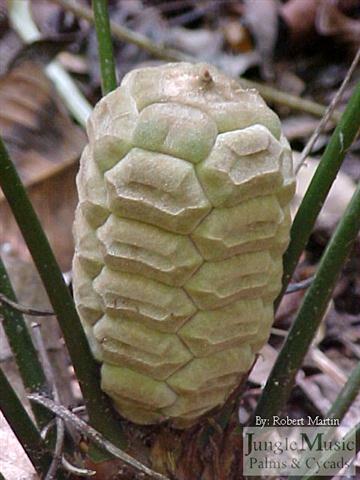 When mature, the female cone dehisces with seeds falling to the ground. Seed dispersion may be assisted by hungry birds or animals. 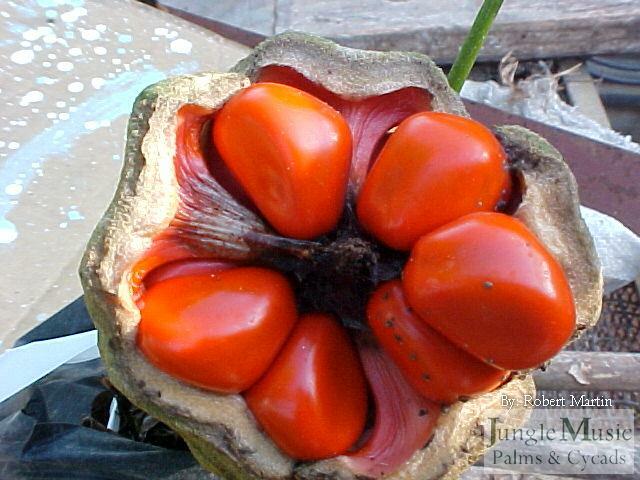 The fruit on the mature seeds is often very colorful with red being a color commonly seen. 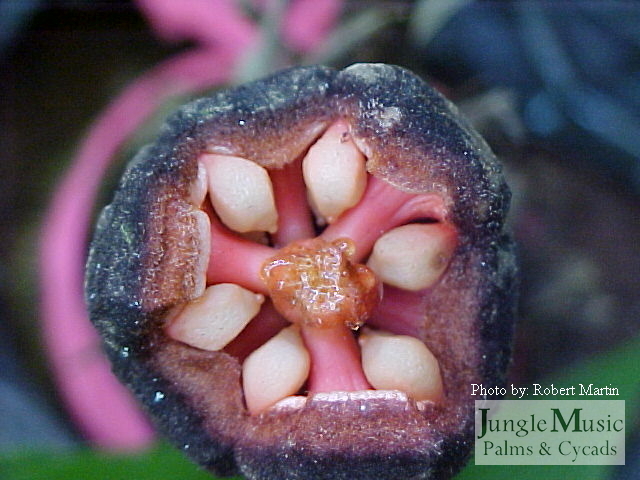 The fruit is fibrous and very adherent to the inner woody seed. Cleaning of such seeds usually take manual efforts and is time consuming. Below I will show an assortment of cones, including both male and female cones from various species. 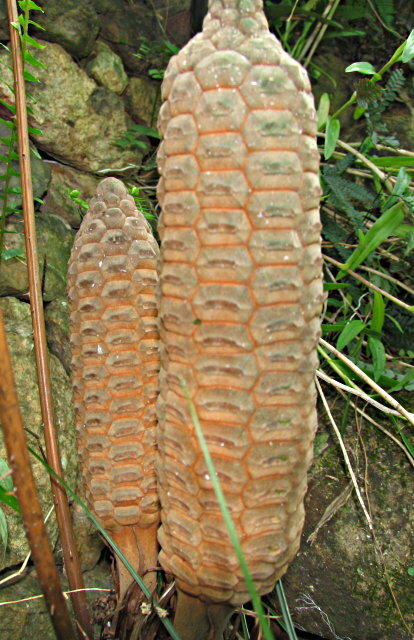 As with other genera of cycads, female cones tend to look like a small pineapple whereas males look like a thin, skinned cob of corn. It is well known that many types of cycads have an "after ripening period" before seeds produced by female cones are ready to germinate. This can be as long as six months on some species. This after ripening period is much shorter on most species of Zamia. On some species, seeds are ready to be germinated immediately after removal from the cone. It is best to remove the fruit from the Zamia seeds before sowing them. This fruit is lush and fibrous, often adhering to the inner seed. The most common method of removal of this fruit is using a small knife or tool. One should then wash off any remnants of fruit with a small scrubbing pad. 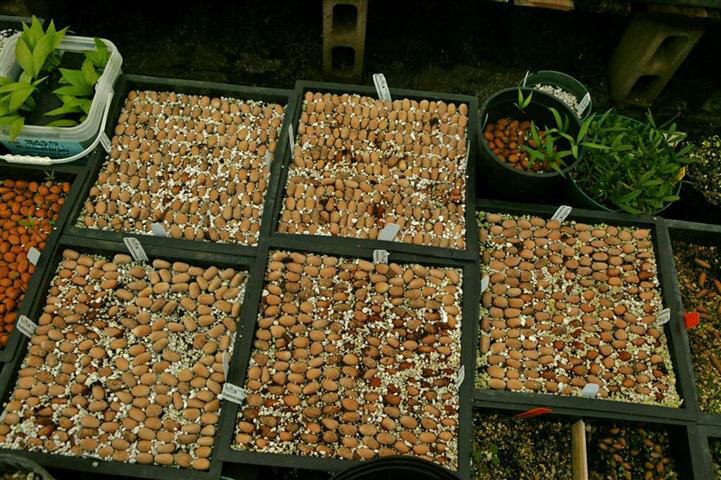 Seeds should then be placed minimally below a well draining germination mix. We usually submerge larger Zamia seeds so that the top half of the seed is visible. We utilize a germination mix of 3 parts of #2 Perlite mixed with one part of coarse peat moss. We utilize community pots with multiple seeds in one container. We mist the container about twice a week, just enough to keep it minimally damp. Your germination mix must be well-draining or you will rot out the seeds. With an excellent job of pollination (either naturally or by hand), germination rates may exceed 50%. A 20% success rate is much more common with high quality seeds. If pollination did not occur, you may get no germinating seeds. The first sign of germination will be the appearance of a light colored radical root growing down into the mix. Within weeks or sometimes a month or two, a small leaf will emerge from the seed. When this first leaf has harden off and becomes firm is a good time to manually remove the seedling and put it into its own container. Bottom heat under the community pot may assist in germination. Better results will be obtained when germinating inside a greenhouse where temperatures and humidity are higher. 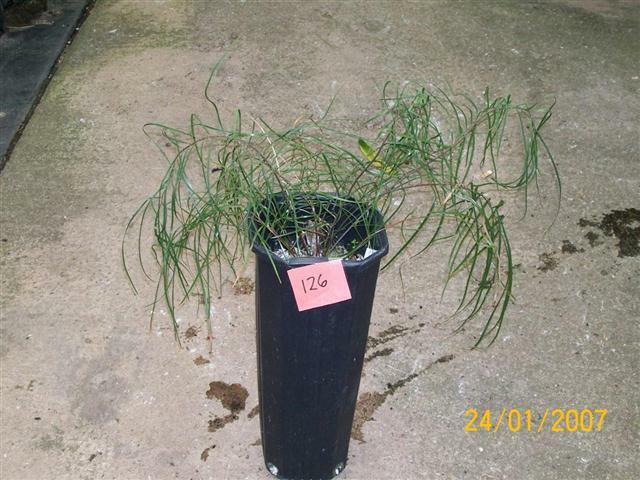 Below is a picture of a larger community pot with hundreds of new Zamia seedlings. Here we are not discussing a germination mix, but rather the soil you will utilize in growing a plant to maturity. As mentioned above, one of the key factors involved in successfully growing Zamias is a good draining soil. Elsewhere at this website I give a potting soil formulae for growing cycads with special attention to specific changes for Zamia. With Zamias I utilize more organics in the mix than I would for Dioons or Encephalartos. Be aware that, over time, these organic materials break down and will cause a sticky decomposed soil at the bottom of the containers. This can lead to death and rot of the plant's roots. Therefore, it is imperative with Zamias (unlike other types of cycads) to change the potting mix in the container from time to time. You'll find that when this is done, a stalled Zamia may spring back to life and begin another cycle of vigorous growth. 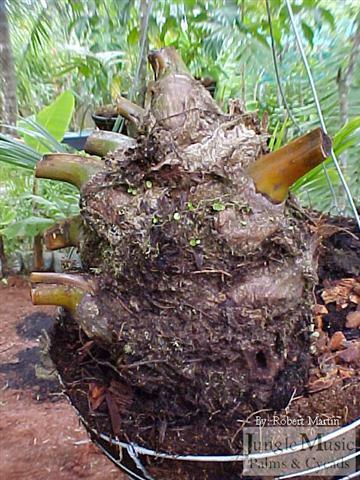 Below is a picture of a standard cycad soil. This contains wood chips, peat moss, pumice, sand, perlite and charcoal. To make one specifically for Zamia species, I'd recommend adding some more organics such as small fir chips, redwood chips or wood shavings. Such a mix will still have great drainage. Zamias benefit from high quality water. By this I mean water that is as close as possible to rainwater. If you live in an arid area, reverse osmosis units can produce such water. Hard water (often seen with domestic water wells) with high content of salts can lead to stunted growth or brown edges to the leaves. Municipally delivered water can also cause this. Misting or spraying of the leaves from time to time is also of benefit. Utilization of hard water for misting may leave salt deposits on the leaves. For many of the more tropical species, high ambient humidity is important for optimal growth. This is most easily accomplished inside a greenhouse environment. Unlike some other types of cycads, Zamias do not demand an extremely deep pot. This is not surprising when you consider where they normally live in habitat. The rain forest floor is well draining and tends to be shallow. There also is ample rainwater. Contrast this to a Dioon from an arid desert environment where the root system may have to go deep and far to obtain water. Also remember than one Zamia species, Z. pseudoparasitica, lives epiphytically in trees with a shallow root system spread over branches or in the forks of trunks. As with other cycads, when you see roots of the plant coming out the drainage holes of the pot, it may be time to consider repotting the plant into a larger container. I've found it takes the typical Zamia about two to four years to outgrow its container. At maturity, it may be possible to not increase the container size again and just change the potting soil from time to time. When growing in a greenhouse, make sure you provide adequate ventilation. This promotes growth and also helps to minimize insect problems. This can be accomplished in a greenhouse by the addition of fans to the interior greenhouse environment. In terms of temperatures, it is safe to assume that most Zamia species do not like to go below a freezing temperatures. There are quite a few frost tolerant species, but as a group most prefer temperatures above freezing. Of all the types of cycads, probably Zamia are the least tolerant of cold weather. Optimal cold temperatures would not be below 40 degrees F. Optimal high temperatures for Zamias would mimic what is seen in the wild. For some species this can be as high as 100 degrees F., although more commonly it is in the mid to upper 80's F.
First and foremost, I should mention the problem of selecting the wrong species for your environment. Too low of winter temperatures will kill many Zamia species. Many Zamias like Z. skinneri, cremnophila and dressleri require very tropical conditions. They do not tolerate cold weather well and may actually die from cold. 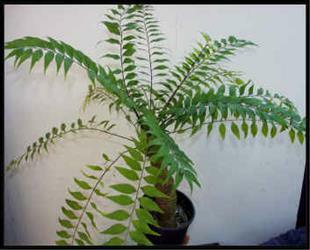 Other less tropical species such as Zamia furfuracea, loddigesii, and angustifolia are more tolerant of cold weather. Often enthusiasts are "trying to push the envelope" and grow some of the in-between species that may survive in their area. Fortunately, there are a lot of species in this latter group. But, if you live in a cold area, check with your supplier as to the cold hardiness of the species you are buying. Also, try to get a plant that was grown in your locality if possible. This way it might be familiar with your weather. 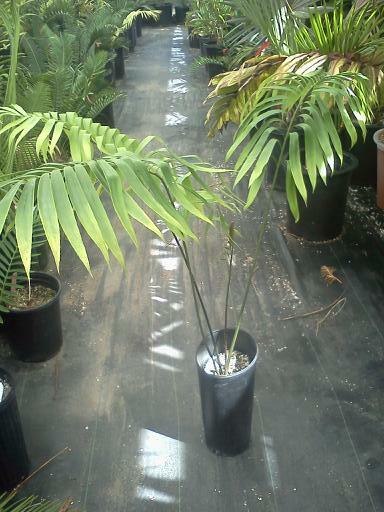 Importing a plant from a more tropical environment might result in failure. It's not possible to list here the cold tolerance of every species. But, as a generality, low temperatures of 40 degrees or higher are needed for the most tropical species. If you get cold weather down to about a freeze, quite a few are possible. Typically, when you get cold burn to a plant, all of the leaves are universally affected and may turn brown or discolored throughout the plant. Sunburn is another problem you may encounter. The majority of Zamia prefer filtered light. If one inadvertently puts such a plant into too bright of sun, a brownish discoloration followed by the necrosis of the leaf will occur. It it is a mild insult, you may only see a limey yellow-green color to the leaf when it should be dark green. Further insult with sun will make a leaf blanched and faded appearing. Severe sunburn makes the leaf turn brown and dry. See the photo below for an example of sunburn to a Zamia lindenii. Although it is subtle, you see the brown discoloration to the most exposed leaves and the overall faded green appearance to the plant. Areas that turn brown will never return to their normal color and appearance. Of note, sometimes it is difficult to tell sunburn from cold damage. However, with sunburn it is always the most sun-exposed leaves that show the damage; cold damage is more universal and diffuse. Regarding insect pests, we have found that mealy bug is the most commonly seen infestation. These sticky, white, wooly insects like to live in hidden spots in crevices in the plant's structure, in the crown of the plant or on the underside of the leaf. Removal by hand or with a strong spray of water sometimes works. We utilize a combination of horticultural oil with an insecticide and this seems to work. Scale is another problem you might see. If you have infestations of ants, scale is more likely as the ants "farm" the scale. Crawling beetles can eat Zamia leaves and spider mites can be a problem in poorly ventilated greenhouses. The two pictures below show a mealy bug infestation on a Zamia. These insects like to hide in tight spots and get on the back side of the leaves. But, when bad, you will see them on the dorsal leaf as seen below. Black sooty mold can appear on the leaves of cycads, especially older mature leaves. It appears like a black colored blanket on the leaf and can be wiped off with your finger. However, without correction of the cultural problem, it will return. It is seen in poorly ventilated greenhouses, especially with ant problems and simultaneous scale infestations. Handling these problems will markedly improve the tendency toward mold. If your mix decomposes, rot can set into the roots. Also, over watering and poor drainage can lead to fungal root problems. If you get a fungal problem in the crown or caudex of the plant, it is usually a rapid and terminal problem that doesn't respond well to treatment. If you get this, immediate dissection of rotted trunk areas are needed with re-rooting of the remaining caudex if possible. When you get this condition, you will see rapid and total collapse of the crown of leaves. Below are two pictures showing black sooty mold on a Zamia leaf. Black sooty mold often appears on the exposed, dorsal side of the leaves of Zamia. And, it is often accompanied by infestations of scale, mealy bug, or other problems. The infestation below has led to the general decline of this plant. This refers to the edges or ends of the leaflets getting brown, dried out or discolored. There are many causes of this. There are a variety of cultural problems that cause this, the most common being lack of humidity, desiccation from too little water, too hot of temperatures, poor quality or salty water and fertilizer burn. You can also see this when the plant is stealing chlorophyll from old leaves to make new leaves. The photographs below illustrate Zamia tip burn, probably from fertilizer or too hot of temperatures. Poor performance and lack of growth are always the result of some cultural failure on your part. This could be that you picked the wrong species for your environment, your temperatures are too cold or too hot, humidity is too low, soil composition is incorrect, etc. You have to trouble shoot what you have done wrong and solve the problem. The most common problem is that enthusiasts have selected the wrong species for their cultural conditions. Once you have germinated a o replant the seedling into a container. You should wait until the seedling has at least one thoroughly hardened off leaf. Or, you could wait until there are two leaves. Our first step is replanting into the square "Anderson band container" which is a square container that is 3 x 3 x 9 inches in size. We've found that these containers have room for most cycad seedling roots and conserve space on the growing tables. Make sure you use an open, well draining Zamia type of potting soil. Carefully remove the seedling from the community pot. Then, using two fingers, hold the seedling in the pot with proper positioning so that the caudex is about one half to one inch below the upper lip of the container. Then gently pour your mix into the container. Compress the soil ever so softly and water the seedling. Make sure you put newly potted up seedlings into filtered light. Too harsh of sun may kill them. Below is a community pot with one of our staff dividing up the seedlings. 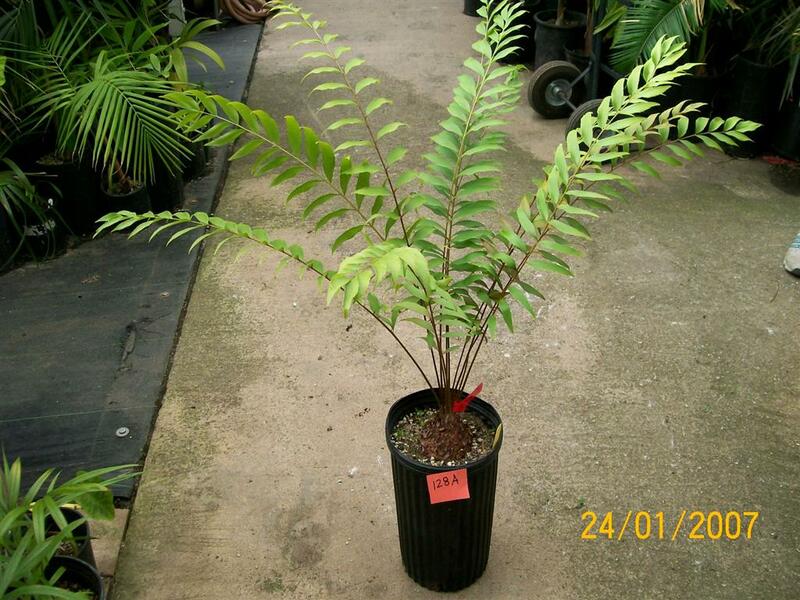 Also shown are a variety of seedling Zamia growing in our seedling containers. The young plants below are in the "band" containers described above. Zamias do quite well in containers. That is, providing that you give them adequate humidity and the right temperatures as well as provide the ideal potting mix. In my experience, the root system of Zamias is less dominant than other species, especially cycads like Encephalartos and Macrozamia. It is possible to grow a very nice Zamia to good size for many years in a container that is easily lifted or moved. Some of the dwarf species can stay in a rather small container for their entire life. Clay pots are a good choice because they tend to breath and not suffocate the roots. Good drainage is important and one could consider a layer of inert material or gravel in the bottom of the container to prevent an accumulation of broken down mix components. Some growers prefer terracotta clay pots, stating that the pots "breathe". This may in fact be true, but the cost of such pots may be prohibitive. Most importantly, remember to repot your plant from time to time and change the mix, especially on the more tropical species. Below are some Zamia from our nursery in containers, various sizes. Many are mature and have been in cone. This dwarf species of Zamia is from Puerto Rico and surrounding Caribbean areas. It is a small cycad with a caudex of six inches. It suckers, forming clumps. Its leaves are about 3 feet long, arching downwards and the leaflets are small. The petioles are unarmed. It likes filtered light and tolerates temperatures into the upper twenties F. The third photo shows the small female cone. It prefers partial sun or strong filtered light. But, it can be grown in sun along our coastal areas here. This is another dwarf species with subterranean stems to a height of about 8 inches and leaves about two feet. The leaflets are keeled, rather scattered in appearance and three to four inches long. When they emerge they are a brown-red color, later turning to green. These are petite plants that cone at a small size. This is an exotic and attractive species from Mexico, often seen on the edges of cliffs. Stems are typically under a foot and rather thin with trunks under three inches in diameter. It will hold several leaves that are typically three, sometimes up to five feet long with long wide leaflets. 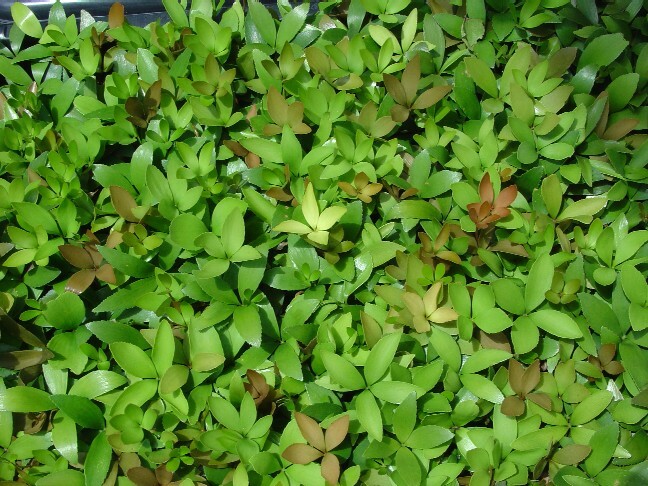 Newly flushing leaves are a very attractive tan or pink/red in color, later turning green. In my experience this is a filtered light plant with cold tolerance perhaps down to the mid to low thirties F.
This Panamanian species of Zamia is very exotic with a corrugated leaf texture. It comes from lowland areas in habitat and has a rather small caudex, well under one foot in size. 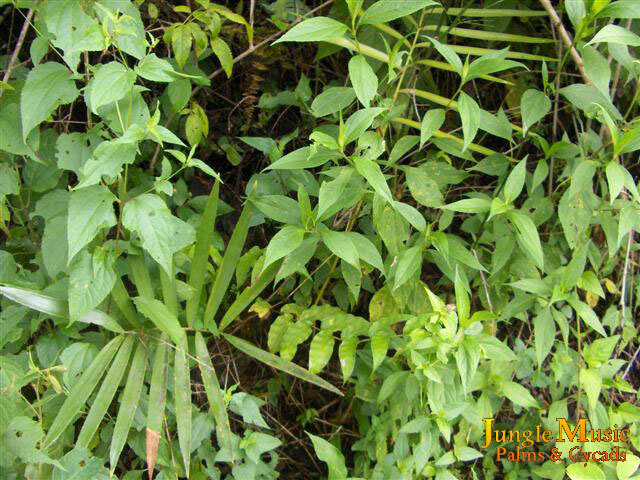 It hold one to three leaves that are about five feet in length. 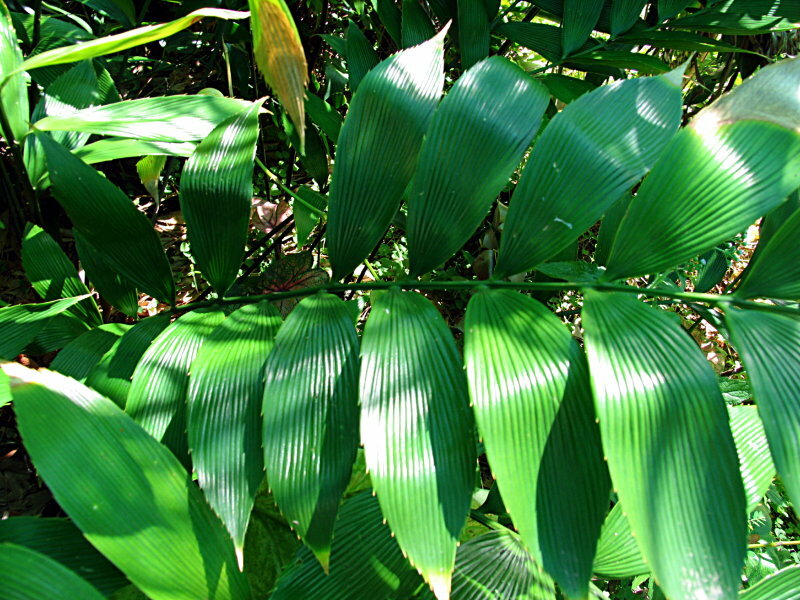 Leaflets, as shown below, are thinner than the corrugated leaves of Z. skinneri. They are four to six inches wide and a foot to one and one half feet long. In the garden, this species would like filtered light and good drainage. As shown, new leaves are red-brown emergent. 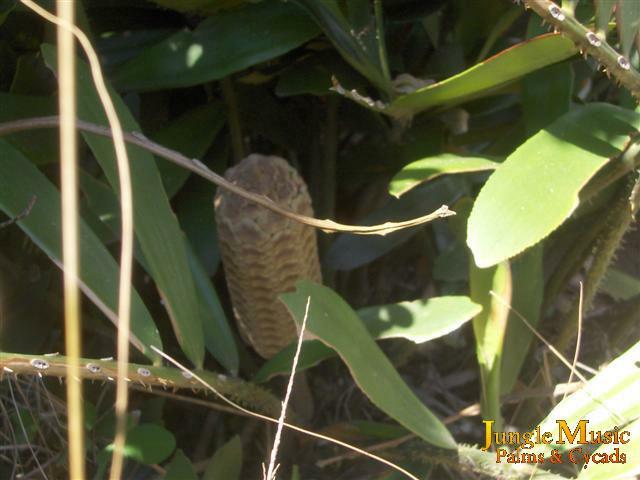 Shown below are photos of the leaves and an intact and transected female cone. This is another Panamanian cycad. Its name comes from the fact that this is a very elegant, handsome plant. It can develop a trunk well over six feet tall and carries a full crown of green leaves that are typically four to five feet long. The trunk diameter is about four to six inches thick. Leaflets are one to one and a half inches wide, four to eight inches long and are serrated at the ends. The leaflet color is a shiny bright green. It prefers filtered light, good draining soil (like all Zamia), and probably will not tolerate a freeze without leaf damage. Below I have shown a pollinated cone with progression through to the ripe red-orange fruit. Also shown are a seedling and mature nursery specimen of this species. 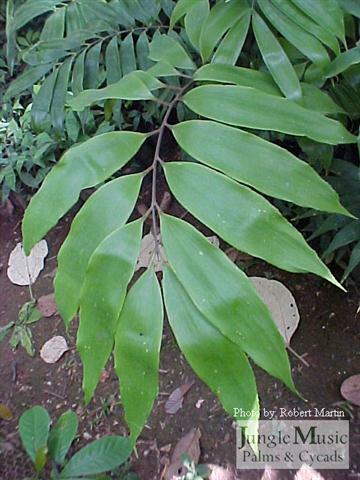 Of note, there is a variant of this species from Panama that is known as Zamia species "blanco" that has white or very light green emergent leaves. It's overall size and leaf length are different. This is an unusual Zamia species from Columbia. It is extremely rare in cultivation. The name derives from the fact that the female cones (and perhaps the seeds) are reminiscent of Encephalartos. Its native habitat is known for being very hot and dry. For this reason, it is hoped that perhaps this is a good species for drier areas like Southern California. It produces a medium sized trunk up to six feet in height, about eight inches in diameter. It is interesting that the petioles are essentially free of spines, unlike many other Zamia species. Leaves are about three feet long, leaflets about a foot long, all with no spines. The color of the leaves are green. About fifteen years ago, a seedsman from South Africa, Bernard Fischer, introduced seeds into the market. That gave nurserymen the first chance ever to grow this species. It is extremely slow growing, likes well draining soil, and to not be overwatered when cold. It is suspected that this species will prefer sunny locations. Pictures of mature specimens are almost non-existent. Because of this I can only show photos of plants from the seeds provided by Bernard Fischer. 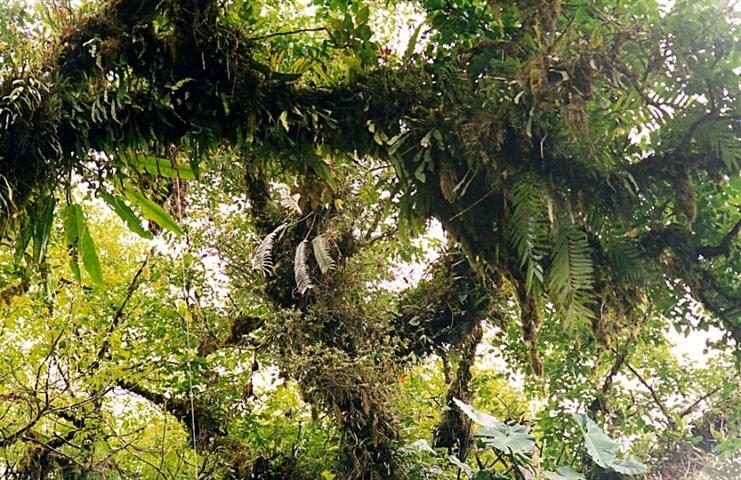 The largest plants below are at least eight years old when the photos were taken. So, it's a very slow growing species. Cold tolerance is not known, but I suspect this species will tolerate a freeze. 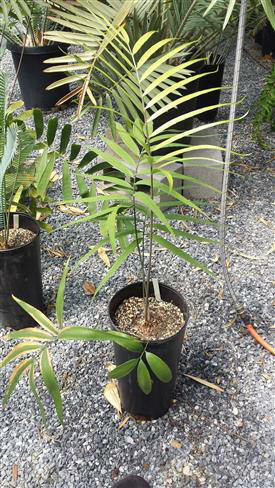 Named after David Fairchild (Fairchild Botanical Gardens in Miami, FL), this tall Costa Rican Zamia species develops a trunk to about ten feet tall and five inches thick. For a cycad, the trunk surface is rather smooth. Although specimens with this much trunk are rare out of habitat, I have personally seen them in the wild, much overhead. I even saw one specimen in the Osa Peninsula in Costa Rica that had been chopped mid-trunk with a machete, had leaned over to the ground, re-rooted into the forest floor, and then grown again to well overhead. Crowns consist of approximately twenty leaves, four to five feet long with a bright green color and lanceolate leaves. There are a few jagged teeth at the end of the leaflets. From the pictures below, you can see that this is a very attractive cycad. It likes warmth, humidity and good drainage. Filtered light is preferred and this species is not good for an area that freezes. 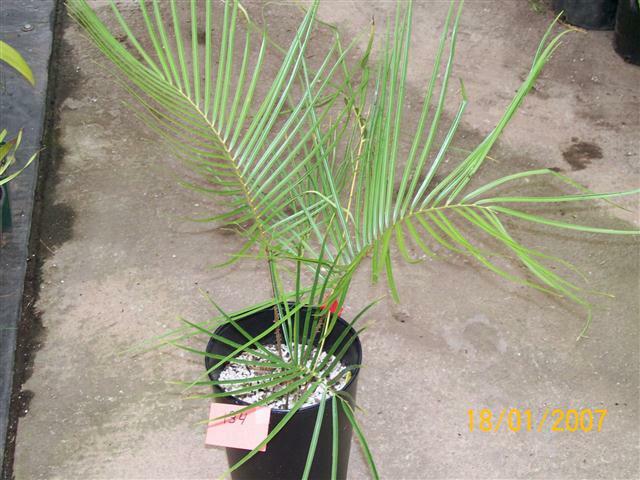 This is a small to medium sized cycad that is commonly seen in nurseries throughout this country. Its popularity is due to the fact that seeds are commonly available, it can tolerate a freeze, it doesn't get overly large and can be grown in sun in many areas. Its trunks are typically one to two feet long, about eight inches in diameter, and often hidden part or totally subterranean. Because it tends to sucker, it is not unusual to get a clumping specimen that is four to five feet across. Leaf length depends on sunlight exposure, with plants in full sun being more compact with shorter leaves. Grown in filtered light, this species can get leaves five feet long. Leaflets can be up to four to six inches long and sometimes several inches wide. A photograph below shows how the leaves are somewhat circular at their apical ends. 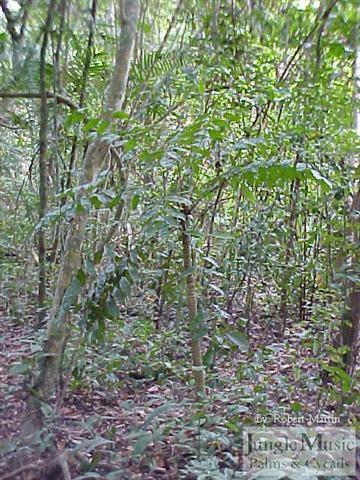 Native habitat for this species is in coastal scrub areas in Vera Cruz, Mexico. Typically it is found there in filtered light with overhead protection. Because of its native habitat near the ocean, this species shows a remarkable degree of tolerance to ocean salt spray. It is somewhat freeze tolerant, probably down to bout 27 degrees F. It also makes an ideal potted plant. This cycad is a South American species native to the Pacific slopes of Ecuador. It produces a medium sized plant with a trunk of several feet, about five inches in diameter. It has long, upright and slightly arching leaves that can be six to eight feet long . It has matched leaflets that are typically one to two inches wide and six to eight inches long. As the photographs below show, the dorsal surface of the leaves are prominently veined giving it a corrugated or plicated surface. These veins run the length of the leaflet. As you can see from the photos, this is a gorgeous species. It is almost impossible to find for sale in cultivation. It is closely related to another South American species, Zamia roezlii, which forms a taller trunk. It is a filtered light species that won't tolerate below freezing temperatures and likes warmth, humidity and good air movement. In Latin, any name that has the word "inermis" or "inerme" in it, refers to the fact that the described plant or species is without thorns, spines or jagged tips on the leaflets. Such is the case of the stems and leaves of Zamia inermis. 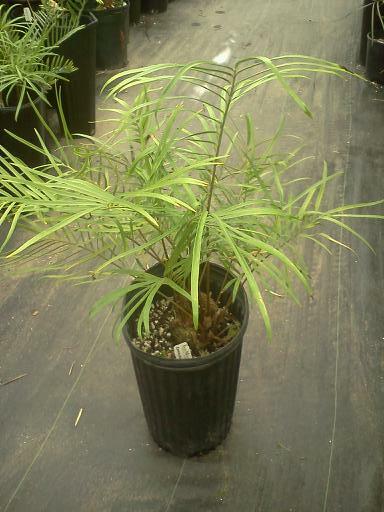 This small to medium size cycad is from Mexico. Its stems can get up to about 3 feet and it holds a good number of leaves that are between two and four feet long. The leaf color is green and the leaflets are paired, thin in width, about ten inches long, and have smooth edges. Both male and female cones are light colored (see photos below). In native habitats, this species grows under trees in dry, poor quality soil. In gardens, this cycad would prefer part day sun or perhaps full sun along the coast. Interestingly, seedlings of this species will show teeth on the leaflets. These will be lost as the plant matures. Cold hardiness appears to be into the mid to low twenties F. It's native habitat extends further north than Zamia furfuracea, which is grown widely as a garden cycad. This might imply that this species can take colder weather than the Z.furfuracea. Also of note is that this species is an excellent growing cycad. 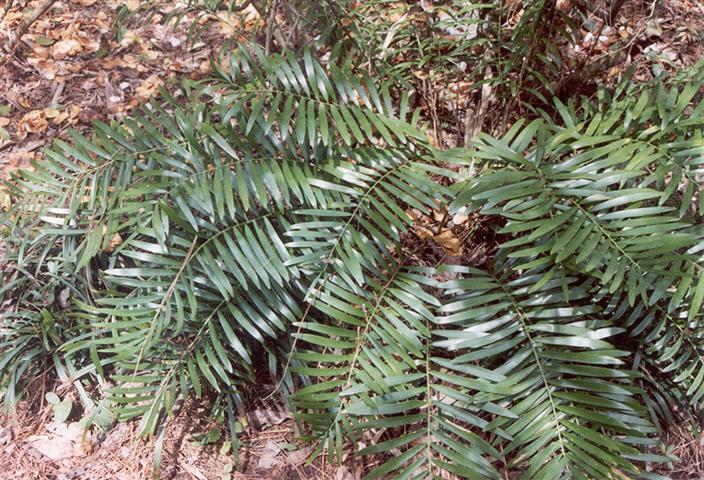 This cycad is native to the southeastern areas of the United States. This includes southern Georgia, Florida and into the Florida Keys. 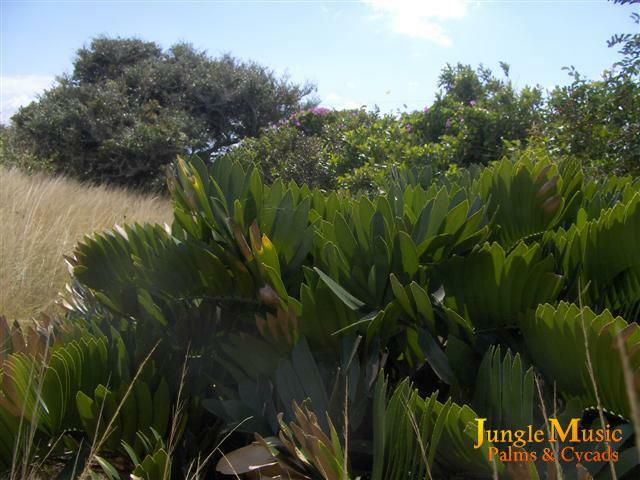 It has many local names including the Coontie, Coonti, Koonti Cycad, and Florida Arrowroot Cycad. This is a small to medium sized green cycad with trunks that are typically six to eight inches in diameter, many times with the trunks being subterranean. Trunks are known to sucker freely. Leaves are two to three feet long with green leaflets. Of note, there are various forms of this species, depending on which habitat plants are from. This plant seems to tolerate coastal sun and filtered light. It tolerates temperatures somewhat below a freeze, but significant cold weather can kill the foliage. If the trunk is protected below the soil line, new leaves will appear the following spring. In frost free areas, this cycad is easy to grow. 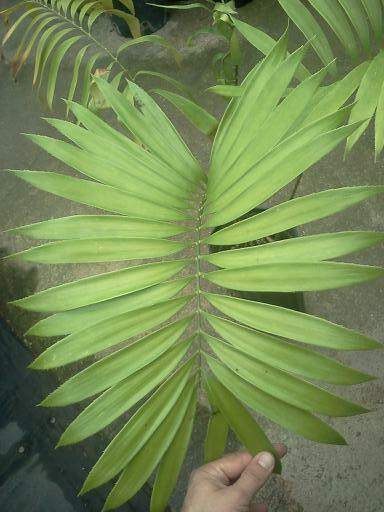 This attractive Panamanian cycad is small to medium in size and rarely carries more than several leaves. Stems are small, usually under four or five inches. It has two, sometimes three leaves about two to three feet long and has paired, somewhat puffy looking leaflets that get to a length of ten inches and two to three inches wide. The color is green. The leaflet edges are smooth except for perhaps a few fine teeth at their terminal end. 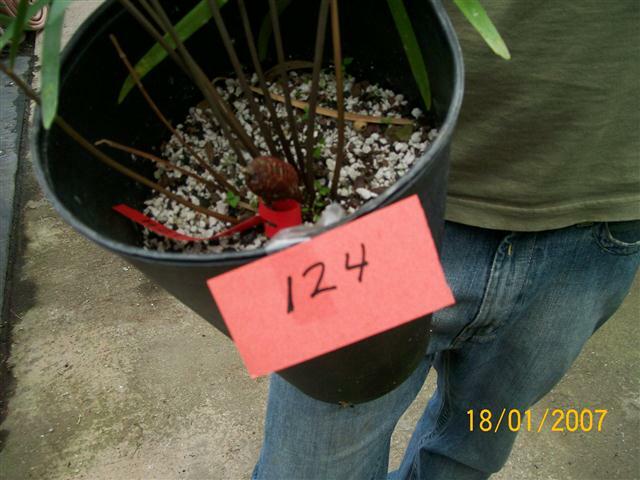 Shown below are a nursery specimen and photos of both the male and female cones. Note the exotic appearance of the foliage. This species can be grown only in gardens that do not see a freeze. They need filtered light and good draining soil. This is one of the few cycad species that comes from Cuba. It is a dwarf species that likes filtered light. Caudexes are small, typically one to three inches and of similar height. With age, these stems have sucker, giving multiple heads of leaves. Leaves are one to two feet long. Leaflets are paired and two to perhaps three inches long. Sometimes these leaflets are circular in shape, other times more elliptical with smooth edges save perhaps a few serrations at the apical tip. This is a very popular cycad because it is quite attractive, an tolerate filtered light in the garden floor, and doesn't get large. 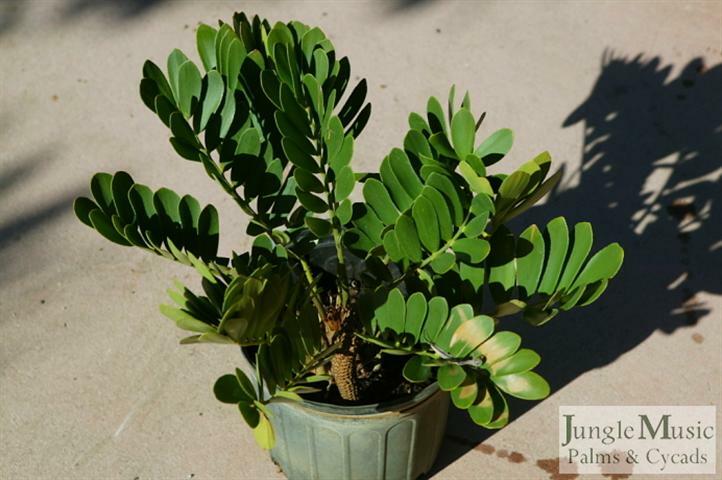 There is another dwarf Cuban Zamia, Zamia pygmaea, which is similar appearing. But, Zamia kickxii is a bigger plant with longer leaves and different appearing cones. In terms of growth, this species is not difficult to grow if you are not in a freezing zone. It prefers filtered light and good drainage. Below are several nursery plants as well as plants in gardens. Note should be made that there are variations in the appearance of the leaflets. Some are almost round like clover leafs, others are more elongated. Among collectors, the round shaped leaflet form is the most popular. This rare and beautiful species is from Ecuador, South America. This is a large cycad with trunks over ten feet tall, six to ten inches in diameter. Trunks are a rather smooth with a brown color. The crown of leaves consists of well over ten leaves, each six to eight feet long at maturity. Leaves are flat in cross section, have a two to three foot petiole, and support about thirty to forty pairs of leaflets, each one foot long and two inches wide. The color is a dark green especially when in shade. There are a few teeth at the end of the leaflets. In habitat, this species lives in mountainous areas over 3000 feet elevation. This is a quick growing species that can be grown in the greenhouse or the garden if you do not freeze. It likes filtered light and rich, well-draining soil. Shown here are several nursery plants and some garden specimens. 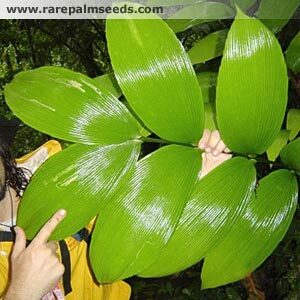 This is another Mexican Zamia that is quite variable in appearance m, both in leaf appearance and the shape of the leaflets. There are also variations in habitat. Caudexes are small, typically two to four inches in diameter with heights under one foot. Stems are often subterranean. Leaves are green, two to three feet long. Stems typically sucker, giving multiple heads of leaves. It is not an exotic appearing species. It can survive temperatures down to freezing with some leaf damage. Buried caudexes are spared damage if subterranean. It prefers filtered light or possibly full sun in the coastal zone. Good draining soil is best. As the pictures below show, this is sort of a nondescript species that isn't too exciting. This is an exotic species that has a native habitat extending from southern Panama into northern Columbia, where it lives in humid rainforest conditions at elevations up to 3000 feet. It is known for a unique thing in the cycad world: Its leaflets have a stem or small petiole attaching the leaflet to the main stem of the leaf. This is seen in a few other species, but Zamia manicata is unique in that it has a "collar" close to the leaflet. This is actually a raised area of tissue just proximal to the leaflet. this "collar" is not apparent until the plant goes from the seedling stage into being a juvenile plant. Caudexes are thin (2 inches) and about a foot tall. Leaves are green in color, three to six feet long with twelve inch leaflets. This medium sized cycad is from Venezuela, South America. It has caudexes about a foot long and between three and six upright, green leaves hosting ten to twenty paired twelve inch long leaflets that come to a point at the end. There are serrated teeth along the lateral and terminal portions of the leaflet (see photo). In habitat, it can be found up to elevations of 1000 feet. 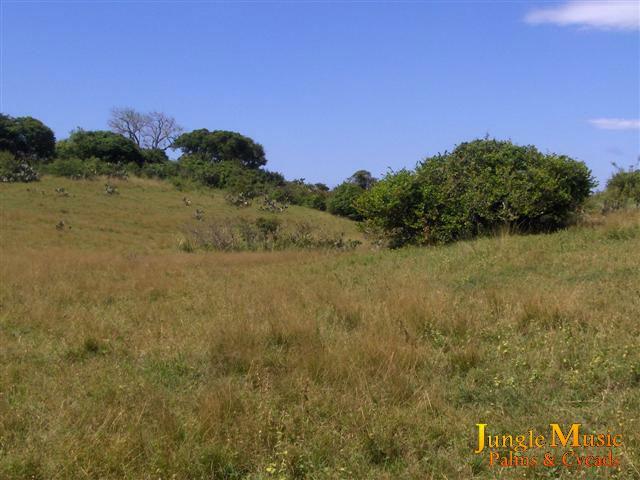 It grows naturally under taller trees and experiences a definite dry season. In my experience, this species will take down to a freezing temperature and is a medium rate growing cycad. I have shown various pictures below of nursery plants with close ups of the leaves and leaflets. Of note, it is known that the mature leaflets are different than the seedling leaflets. This is not unique to this species. Juvenile plants have wider leaflets. These leaflets get longer and thinner as the plant matures. I've seen many specimens of this species that have clustered together multiple caudexes with several crowns of leaves. This seems to make the plants more "bushy" appearing and wider. Because of this, in the garden, give this species room to the sides. This species prefers filtered light and is cold hardy down to a freeze and perhaps a bit below this. 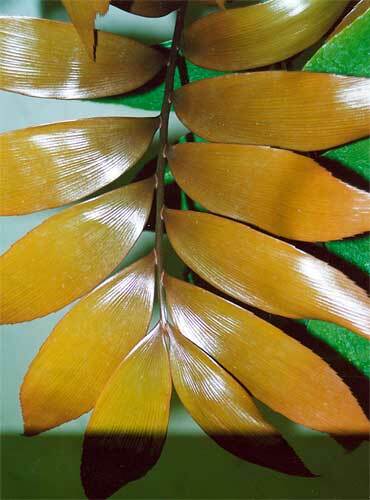 This recently described species of Zamia comes from an island off the coast of Panama. It's hallmarks are the size of the leaflets (huge) and the plicated leaflets (groves in the leaves). Overall it is a medium sized plant. If you look in cycad texts, you will not find this species listed. This is because it was first described several years ago. It is felt to be critically endangered in habitat. It lives in sandy soil natively. Little is known or published about this rare species. Cycad enthusiasts will note it's similarities to Zamia neurophyllidia. But, apparently the leaflets are larger on neosphila. It would like filtered light, not direct sun. photo c/'o R.P.S. by T.S. photo c/o R.P.S. by T.S. This is a very exotic and desirable species that is native to Costa Rica and Panama. Its name comes from the Greek derivation for "neuron" meaning "nerve" and is a reference to the deep veins that are present on the leaflets of this species. This makes it a corrugated or plicated type of leaflet. Stems get up to about five feet tall and leaf length is three to five feet. On any given leaf there may be up to ten leaflets that are each up to twelve inches long. There is a very similar species, Zamia skinneri from the same region that historically has been mistaken for neurophyllidia. However, Z. skinneri has a taller trunk, bigger leaflets and sometimes has red emergent new leaves. Z. neurophyllidia emerge green. This is a frost sensitive species that should only be grown in filtered light. 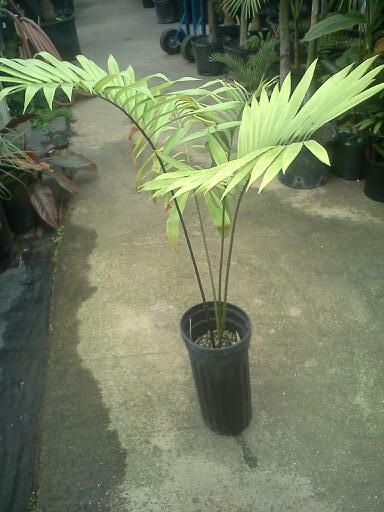 This Columbian Zamia species is an interesting species. The Latin derivation of its name, "obliqua", is "sidelong, slanting, awry". By this is meant that the leaflets of this species have unequal sides and shapes. This is a tall cycad with a trunk up to over fifteen feet, about four to six inches thick. It carries a crown of eight to ten green leaves. The leaves contain about five to ten pairs of leaflets, two to three inches wide and eight to ten inches long. The leaflets have irregular sides and are serrated at their ends. This small cycad comes from the state of Oaxaca, Mexico. Stems are typically three to four inches wide and six to eight inches tall. It holds a small number of leaves with fairly thin leaflets about six to eight inches long. This species does extend to the western parts of Mexico. In habitat there is a lot of variation in the appearance and sizes of the leaflets. 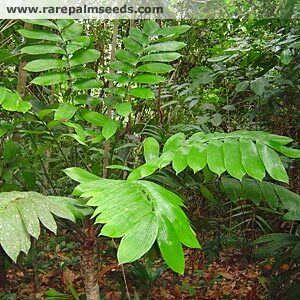 Overall, this species is far less exotic appearing than most of the other Zamia species. It is sensitive to frost and prefers filtered light. Shown below in a coning sized plant. You can see that this species sets a cone as a very small plant. This species has been known for decades as Zamia picta but in more recent times is being called Zamia variegata. It gets its name from the fact that the leaflets contain yellow or gold colored streaks, blotches or spots on them. 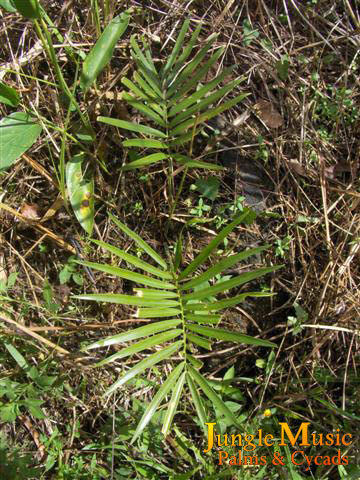 It is a small cycad with stems under on foot in size. Leaves are typically three to five feet long. The leaflets are green. The spots are variable in their intensity, but light colored and a yellow hue. On some plants these markings are more prominent than others. It is native to Mexico and Central America. This is an extremely variable species of Zamia, as the name would imply. The word "polymorpha" translates into "Many forms". It is native to Mexico and Belize. Trunks are usually small, up to about four inches and often subterranean. Leaves can be three to five feet long and have an open petiole with small spines. This species is native to Mexico and Central America and is quite easy to grow outdoors in Southern California. This is an epiphytic cycad that lives in the canopy of overhead trees. The Greek derivation for this species is "false" and "parasite". It does not hard the tree that support it and is not parasitic in any way. It is native to Panama and sees a wet, tropical environment. The caudex can reach a size of almost 24 inches. Leaves hang downwards from the stem and are sometimes up to ten feet long. Leaflets emerge brown colored and are leathery and up to sixteen inches long. Unique to this species is that it is the only known epiphytic cycad. It is supported on the limbs or trunks of trees by aggressive roots that wrap around the tree for stability. It also has nitrogen fixing coralloid roots to obtain nutrition while high in the canopy away from soil. This is a truly remarkable species and rare in collections. Domestically it is often grown in baskets with little or very rapidly draining soil. 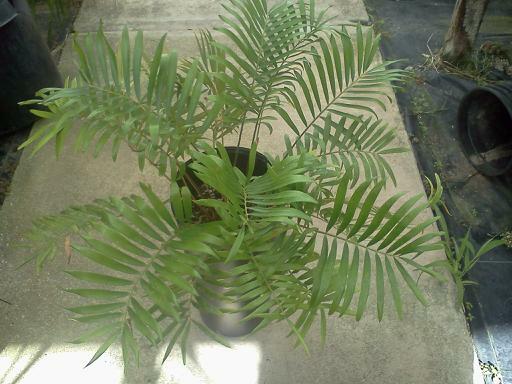 This is a small cycad with a caudex about a foot long and about four inches thick. It is largely a subterranean trunk. Its leaves are abut three feet long with paired leaflets one foot long and about one half an inch thick. Newly emerged leaves are very glossy. It is native to the Dominican Republic and perhaps several surrounding islands in the Caribbean. 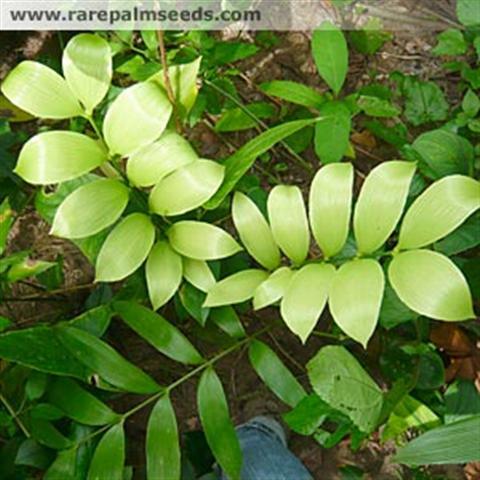 It has historically been confused with Zamia integrifolia. It is fairly easy to grow and is best grown in filtered or part day sun. This extremely attractive and tropical appearing Zamias from southern Mexico. It is extremely rare both in habitat and in domestic plantings. Its trunk is up to about two feet maximum with a diameter of two to three inches. 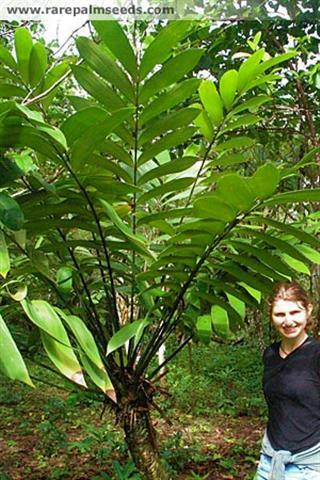 Its leaves are eighteen to thirty inches long and about eighteen inches wide. Young leaves emerge with rusty brown hairs, giving new leaves a red colored appearance. 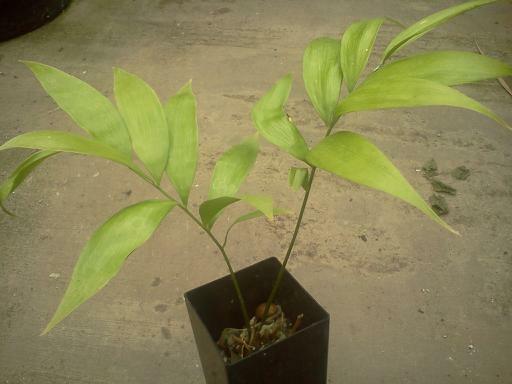 Leaves mature to a green color and have mall serration on the leaf edges. Leaves have a variable amount of palpable veining. This is a large cycad species native to the Columbia area of northern South America. It is felt that possibly Zamia roezlii has the tallest trunk of any Zamia. Trunks can get up to twenty feet tall with a width of six to perhaps eight inches. 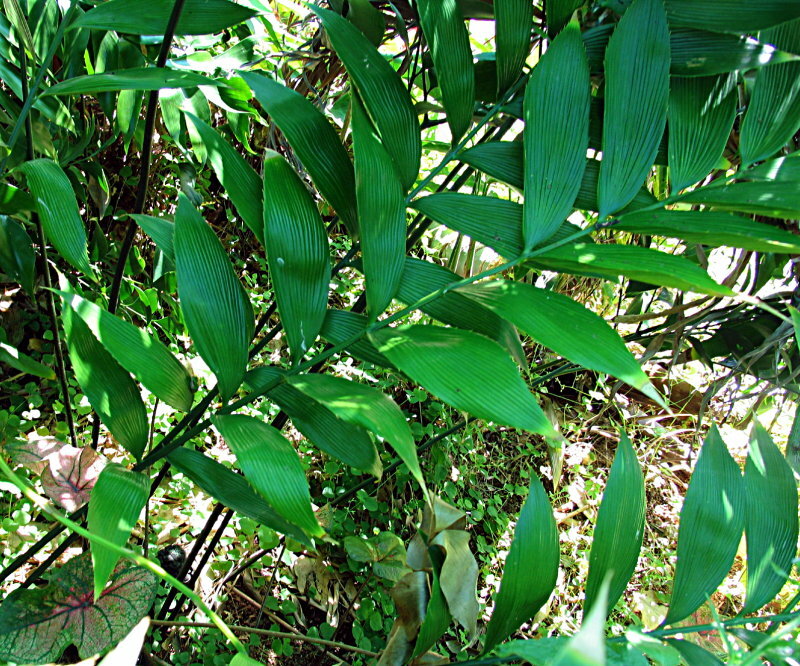 Leaves are quite long and upright. They can reach lengths of eight feet and are bright green in color. Leaflets are about a foot long and one to one and a half inches wide. They are somewhat leathery to the touch. The underside of the leaves has prominent grooved veins and are a paler green color. The dorsal side of the leaves has indented groves that you can feel. New leaves can emerge a light red color. Petioles are prickly and leaflet edges are entire. This is a filtered light species that likes frost free areas and good draining soil. 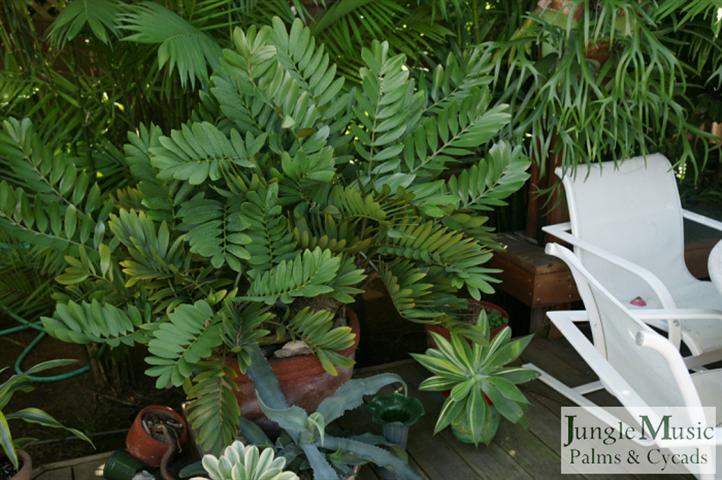 This gorgeous tropical Zamia comes from the Caribbean coastal forests of Panama. It is one of the most impressive cycads in the world. Most striking are the huge leaflets that have been reported to be eighteen inches long and eight inches wide! Some forms are also red emergent as shown below. Stem size can reach eight feet with a six inch diameter. It leaf length is up to six feet. This species is often confused with Zamia neurophyllidia, which has smaller leaflets. 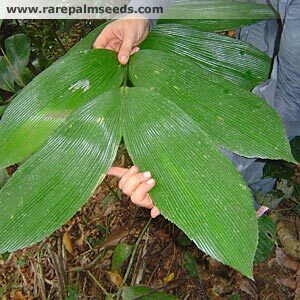 In it's native environment at mild forest elevation, Zamia skinneri is in rich, well draining soil and sees adequate moisture and heat. In Southern California, this would be a greenhouse environment as this species will not tolerate a frost. I wish to thank Tobias Spanner for his great photos below. The Latin derivation of the word "spartea" refers to grass and this applies to this species. This is because of the very thin leaflets. In habitat is is difficult to find plants in the surrounding grass. It is native to Mexico Caudexes are subterranean and under three inches thick, one foot long. Leaves are under three feet long, gently curved downward. Leaflets are typically one quarter to one third maximum of an inch. They come to a point. This species is frost hardy and seldom seen in collections because of the popularity of the wider leaflet species. This is a small cycad that has green leaves and is native to Mexico where it grows in mountainous forests at heights of 1000 to 5000 feet. Because of this, it has a bit of cold hardiness and can be grown in Southern California. Trunk size is typically under six inches, leaves are up to about five feet long. Newly emerging leaves can be green or red. Leaflets when mature are green and shiny and have small spines on the margins. This species prefers filtered light and good draining soil. 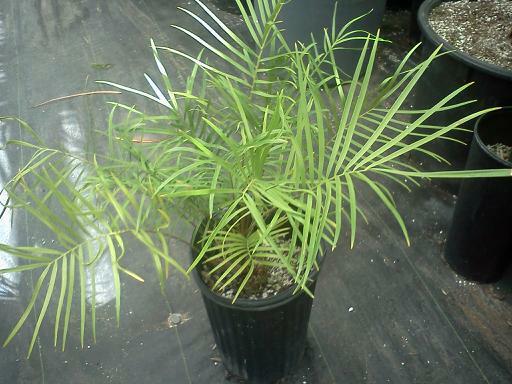 This is a small to medium sized tropical Zamia that comes from several Central American countries. Its trunk size can get to a bit over a foot, leaves are two to three feet long and about two feet wide, and leaf color is green. Newly emerging leaves are bronze for a short time. Zamia standleyi prefers filtered light and good soil drainage. Cold hardiness is down to about a freeze. Note from the close up photo, leaflets are finely toothed but not overly armed. This is a very exotic appearing plant. This is small Mexican cycad with stems typically under one foot in size and leaves green in color and up to three feet long. It usually holds about five or size leaves, sometimes more. It is a variable species and leaflets can be lancolate or wedge shaped. Leaflets are quite thin in texture and have soft spines on the margins. Overall, this species has a "fern-like" appearance. The names "vasquezii" replaced the more commonly known name of "fischeri" in the past ten years or so. 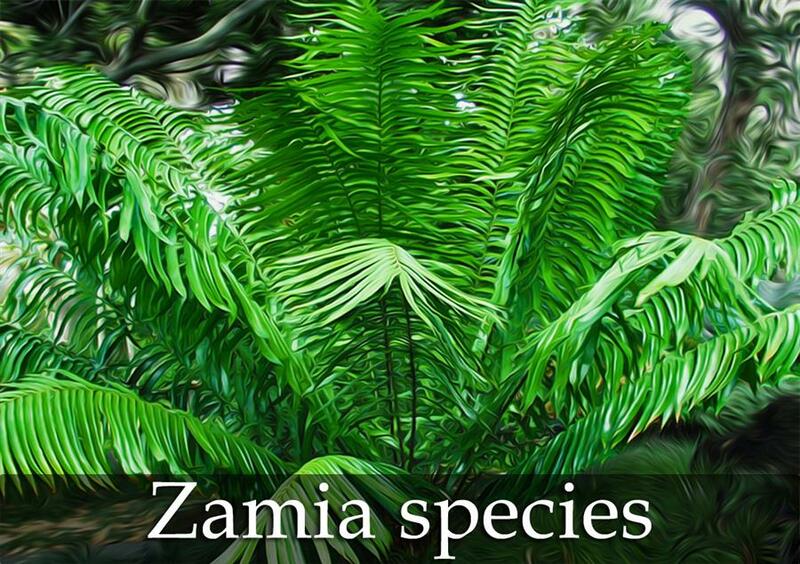 Zamia, as a genus, has species that are widely varied and different appearing. All are new world cycads and most are of small to medium size. Many are exotic and tropical appearing. One will find that some species are reasonably cold hardy and easy to grow. These tend to be species with thinner leaves. The more distinctive species with plicated leaflets, large leaflet size and a very tropical appearance tend not to be cold hardy and many will not tolerate a freeze. Most species want filtered light although some will tolerate coastal sun. Some are suitable only for greenhouse culture or tropical regions. I hope that this article stimulates your interest in this truly amazing group of cycads. We have at one time or another had all these species for sale. Zamia species blanco by RPS / T.S. Of note, our nursery sells many of the species described above. Send mail to Jungle Music with inquiries about Jungle Music nursery stock or mail order.